In the fall of 1957, Little Rock's Central High School was in the headlines throughout the world as a place of turmoil, even shame, as Governor Orval Faubus attempted to stop a few black kids from enrolling in that school. The Little Rock school crisis is well documented, but another civil rights episode occurring in Arkansas at the same time is less well known. That year, in Fayetteville, the state had its first widely known African-American high school football hero. His name was William Lee Hayes, nicknamed Bull Hayes. He played fullback and kicked. His team, Fayetteville High School, had an outstanding football team that ended the year without losing a game, outscoring opponents by 269 points to 33. Bull Hayes was the best of several very good players that led the team to its undefeated season. 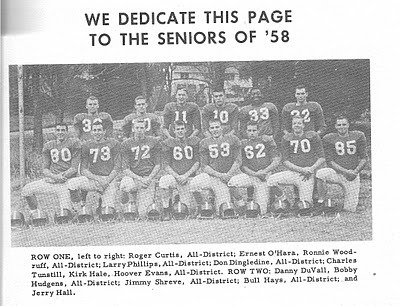 Apparently, Hayes was academically ineligible to play football during his junior year, but during his senior year, in fall 1957, Hayes became a celebrity, at least regionally, for his powerful running. His achievements on the football field were the stuff of legend. Equally impressive was how well he fit into the team. Speaking years later, his teammates expressed deep affection for him. Jim Shreve, the team's all-district and all-state quarterback, told Fayetteville sports writer Grant Hall in a 1975 interview, "Everybody on the team just loved Bull. We kidded him all the time and he kidded us. 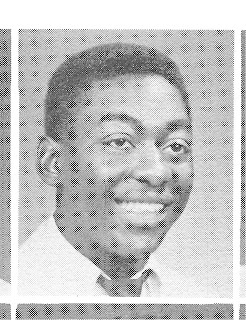 There were never any racial problems at Fayetteville High, even though we were only the second school in the state, I think, to integrate." (Hall, 1975). Bull Hayes was six feet tall and weighed 190 pounds, not particularly big for a fullback. But, as Wheeler said, he had powerful legs, plus quickness and speed, that made him an explosive runner. He was a constant threat to break through the line for a long run. When the opposing teams focused on stopping him, Shreve would fake handing the ball to him and reel off long runs. We actually ran what amounted to a wishbone," remembered Shreve. "Bull lined up right behind me, and sometimes we'd just snap the ball through my legs right to him. He would be at full speed after one or two steps. We were never timed in the 40-yrd dash back them, But I'm sure he could have run a 4.5. (Hall, 1975). In 1957, after the Bulldogs had resumed playing Harrison, Fayetteville players riding the team bus through the Harrison town square saw a black dummy hanging from a tree and signs in store windows that read, ‘Beat Bull.’ During the game, Hayes was verbally abused by fans, but the night passed without major incident. (Brill, p. 56). Hayes had to deal with more than the usual high school hassles. When the Fayetteville team bused into Harrison for a game, an effigy of a black man was hanging from a tree in the town square. According to the Democrat-Gazette, Harrison star Don Branison said his team was told to stop Bull Hayes no matter what it took. "We tried to kill him...We tried to hurt him real bad," Branison said. Despite such hostility, FHS and Bull Hayes prevailed for a perfect season. Hayes received a football scholarship to attend the University of Nebraska. According to Bardburd, "Hayes had offers from Oklahoma State and Tulsa, where Arkansas played regularly. 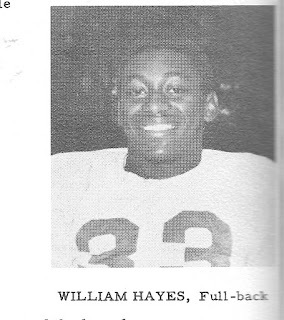 To avoid the embarrassment of a local black player making them look bad, the Arkansas staff arranged a full ride to University of Nebraska for Bull Hayes. " (Bardburd, p. 130). Bradburd does not provide a source for this assertion. 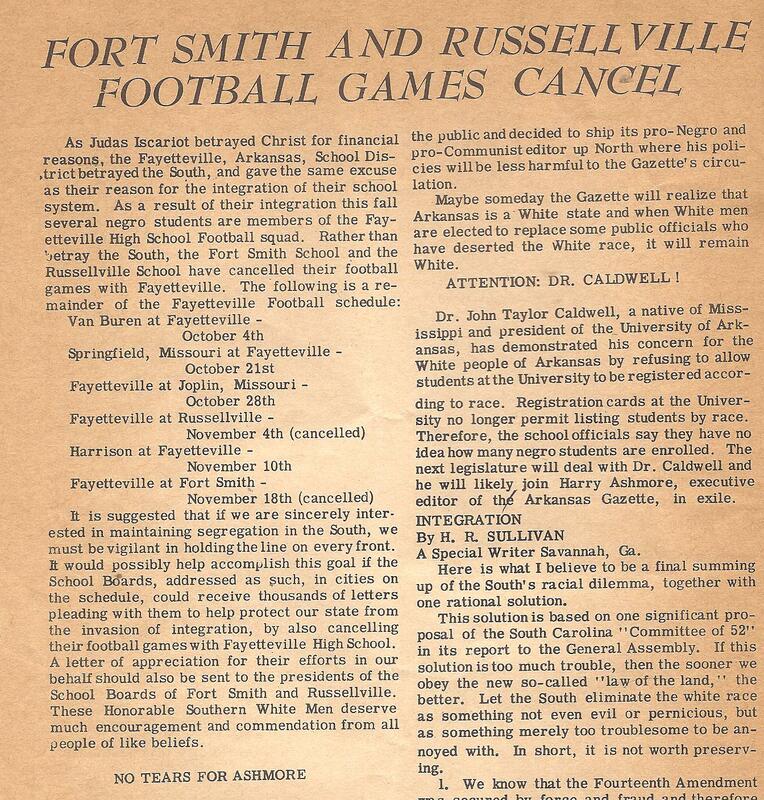 Of course, at the time, the University of Arkansas football team was segregated and would remain so for many years to come. Hayes had a good freshman year at the University of Nebraska, but had to leave the second year because of academic difficulties. He played football for two years at Joplin Junior College and finished his college career at Arkansas AM&N. He had a tryout with either the Cleveland Browns (Brill p. 56) or the St. Louis Cardinals football team (Grant, 1975), but did not make the team. After his graduation from Arkansas AM&N, Hayes was hired to be executive director of the Boys Club in Topeka, and he held that position until his death, at the age of 36, on September 7, 1975. Like others African-Americans in Arkansas who were the first to break different color barriers, Bull Hayes was a pioneer. He was hero not only for his accomplishments on the football field that won the admiration of his teammates, schoolmates, and much of the population of Northwest Arkansas, but also for his role in the integration of high school sports in Arkansas. In truth, thanks to him, 1957 was a very good year for the desegregation of Fayetteville schools, quite a contrast to the unseemly events in Little Rock. Adams, Julianne L. and Thomas DeBlack. Civil Obedience: An Oral History of School Desegration in Fayetteville, Arkansas, 1954-1965. University of Arkansas Press. Bradburd, Rus. 2010. Forty Minutes of Hell: The Extraordinary Life of Nolan Richardson. Amistad. Brill, Andrew. 2006. Brown in Fayetteville: Peaceful Southern School Desegregation in 1954, The Arkansas Historical Quarterly, Winter, VOL. LXV, NO. 4, pp. 55-58. 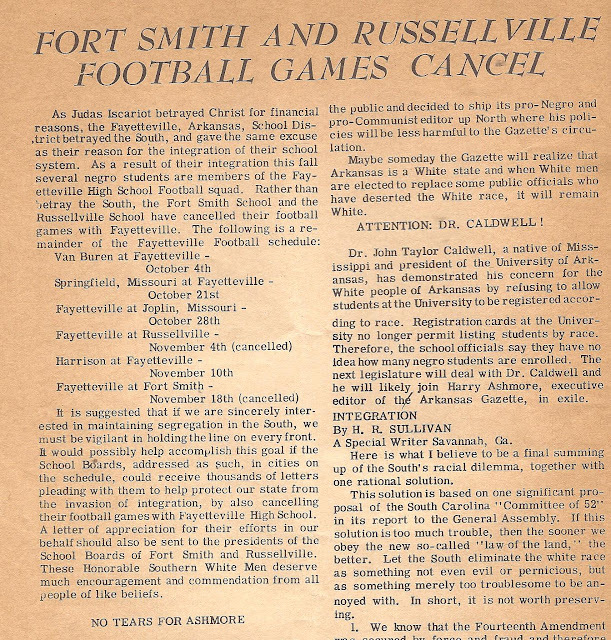 Fort Smith and Russellville Football Games Cancel [sic]. 1955. Arkansas Faith, p.17. Hall, Grant. 1975. 'Bull' Hayes Remembered by Former FHS Teammate. Northwest Arkansas Times, Sept. 14. Ivy, Darren. 2001. Integration Found ‘Bull’ on Front Line. Arkansas Democrat-Gazette, December 30. Many thanks for your comment. I enjoyed your Slate story about two fine athletes who are undeservedly little known in the state. Also, I was pleased to read about the formation of the Arkansas African American Sports Center. Your efforts to get the excluded athletes into the record books are admirable. Also, the idea of an AAASC Hall of Fame is an exciting one, and I'm sure Bull Hayes would be a great candidate for it. I could also suggest a couple of my teammates on 1963-64 and 1964-65 Fayetteville High School basketball team for consideration. They were the first African-Americans to play, in 1964, in the Arkansas basketball state tournament, and they also were on the first integrated teams to play basketball against high schools such as Conway, El Dorado, and Texarkana. 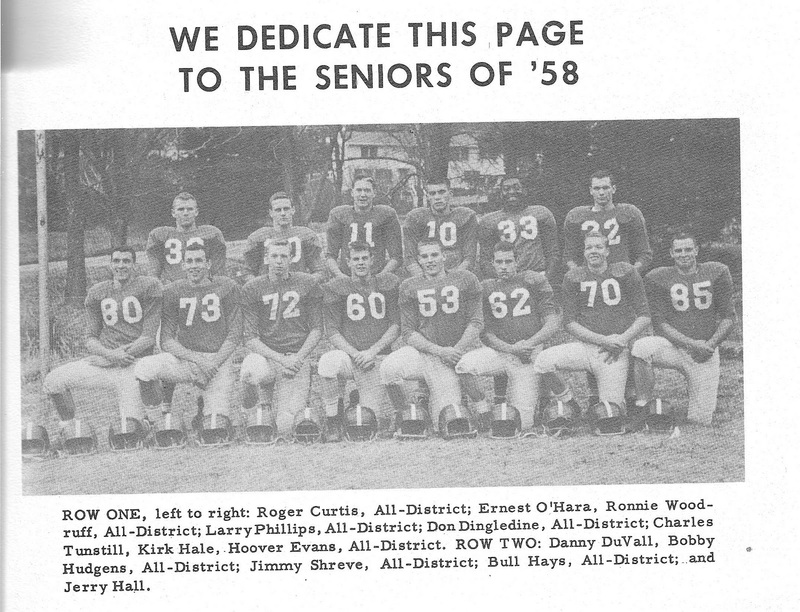 Robert Wilks was the best athlete at FHS in 1965 and for a couple of years on either side of that year. Louis Bryant was an excellent basketball player. He later became an Arkansas state trouper and was tragically murdered at a young age while on duty by a racist militia type. Good luck with your initiatives and writing.